A tooth has three layers enamel, dentin and pulp. 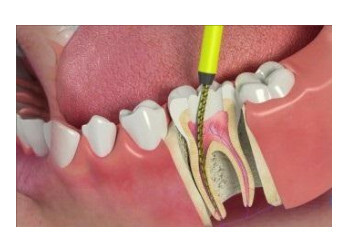 When cavity is deep and has reached the pulp, RCT is required to be done. The procedure is entirely painless and includes removal of entire infection from within the tooth; all the root canals are cleaned and medicament is placed. The tooth is then sealed to prevent infection after RCT procedure. After RCT is performed, the tooth turns brittle and weak. This is why, post the RCT procedure, placing a crown is extremely important for protecting the tooth. Placing a crown, strenghtens the tooth, making it more capable to withstand forces as the normal tooth. Now-a-days even badly broken teeth are saved by RCT and rebuilding with metal or white fiber posts & core. Single sitting RCT procedures can also be performed in selected cases, saving precious time for the patient.